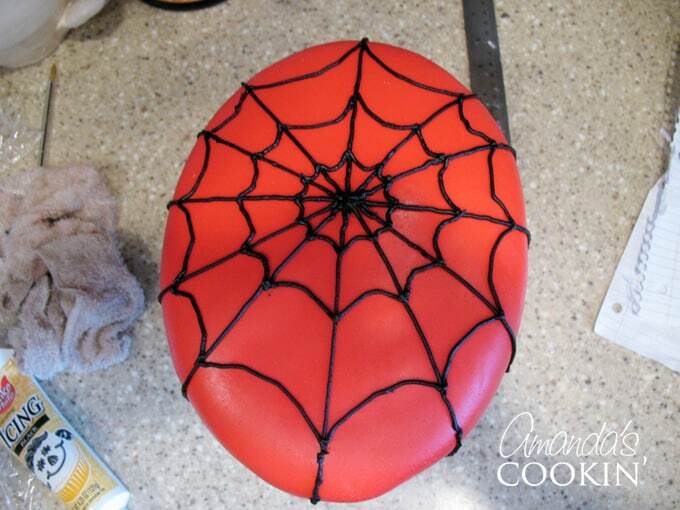 How to Make a Spiderman Cake for your Spiderman party! 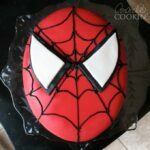 Learn how to make a Spiderman cake with homemade fondant and a cake mix or your favorite homemade cake recipe! Perfect for Spiderman parties! 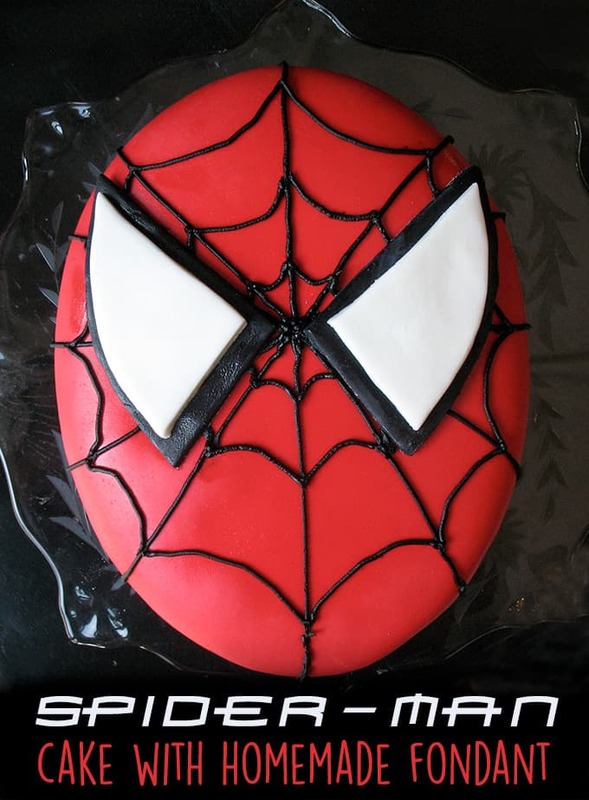 Back in the summer of 2010 my (then) 16 year old daughter asked me to make a Spiderman cake (yes, technically Spiderman should be hyphenated as Spider-man, but for the sake of my sanity I am typing it in this post as Spiderman, no hyphen.) for her best friend’s birthday. I was surprised to hear that her BFF wanted a Spiderman cake, but my daughter insisted that she was indeed obsessed with all things Spiderman. So who am I to question, or for that matter, to say no? So I set out on a quest to find a fun Spiderman cake design. At first I was going to use this cake pan with a simple white frosting, pipe black frosting around it and drag a knife through it to create a spider web design. Kristen wanted a Spiderman face in the middle, so I could have just gone with this light up Spiderman cake topper… but instead I decided to use fondant. Yikes. Fondant. I had never used fondant. It had been one of those “I have to tackle that one of these days” things. It wasn’t nearly as hard as I thought it would be. In fact it was quite easy. I found a great video on working with fondant here and used that to come up with my Spiderman cake. So on with my adventure in fondant. I had heard that store bought fondant is pretty gross tasting, and have heard some great things about homemade marshmallow fondant, so I decided to make my own. This definitely did not go off without a hitch, there were several issues, even though it did all work out in the end. This could have really turned into a long post, so I trimmed the mishaps down a bit. Also, I don’t have a lot of step by step photos as I was so concentrated (and nervous) that I didn’t want to stop to stage photos. Kristen wanted boxed cake and container frosting. I baked a chocolate cake in two 9″ round cake pans. When cool, I chilled them in the freezer for an hour so that I could easily saw off the uneven tops with a serrated knife. Next, I cut a section out of the middle of each cake layer, about 1.5″ wide and set those pieces aside. I slid the two sides together on each cake to make ovals. However, the ovals weren’t long enough to pass as a face, so I turned the cakes a quarter turn, then cut then in half. I separated the two halves and reinserted sections of the pieces I removed earlier. I was able to make longer ovals this way. While this was going quite well, at one point I almost dropped a layer on the floor. I swear I would have cried. After it chilled a while, I assembled the layers with a layer of white frosting between the two, then I gave the cake a crumb coat. Back into the freezer for another couple hours. I finished it off with the rest of the frosting, smoothed it out really well by misting it with water and smoothing with an icing spatula. Back into the fridge. 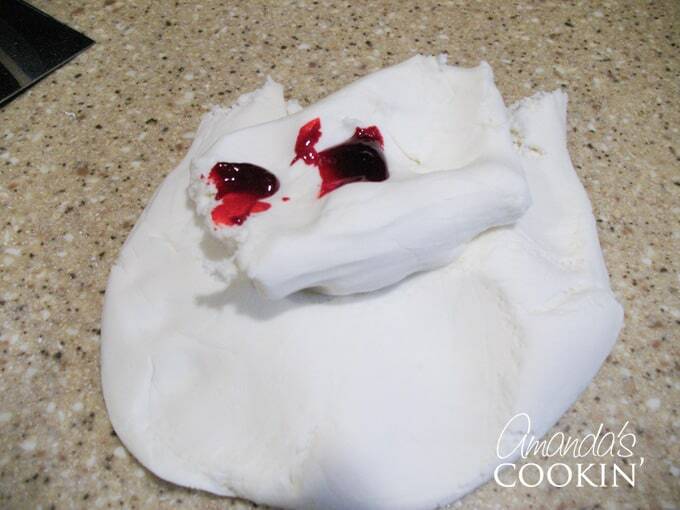 There are lots of different posts and tutorials on making homemade marshmallow fondant. The one that ultimately influenced me the most was this video. However, I must warn you, it’s way too long. She really could have edited a lot of stuff out and still made a great tutorial. I found myself saying “Yeah yeah, get on with it already!” Just sayin’. I forgot that 16 oz. is actually about 1.5 packages – I only melted 1 package. I forgot to add the water to the marshmallows before microwaving them. I ended up adding more powdered sugar that the recipe called for because of my other boo-boo’s. All seemed to work out well, so I wrapped it tightly and let it rest overnight. Once I had a couple of cups of coffee in me, I set out to finish this cake. First thing I did was take the cake out and trim the cake cardboard with a x-acto knife to be the same shape as the cake. 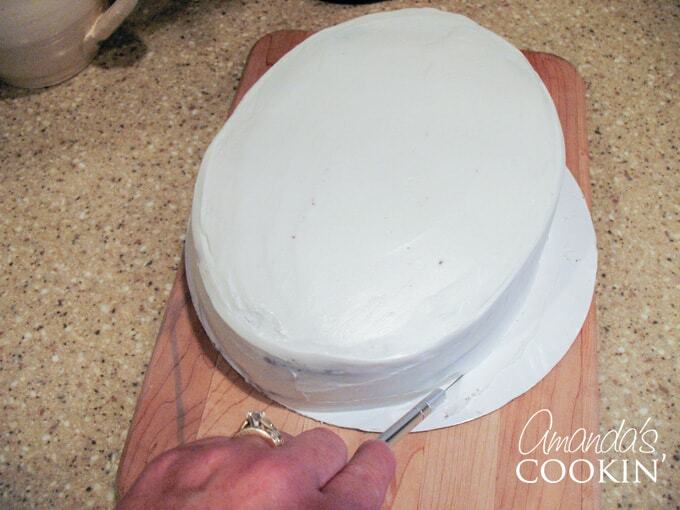 This allows you to trim the ends of the fondant easily once you’ve placed it on the cake. 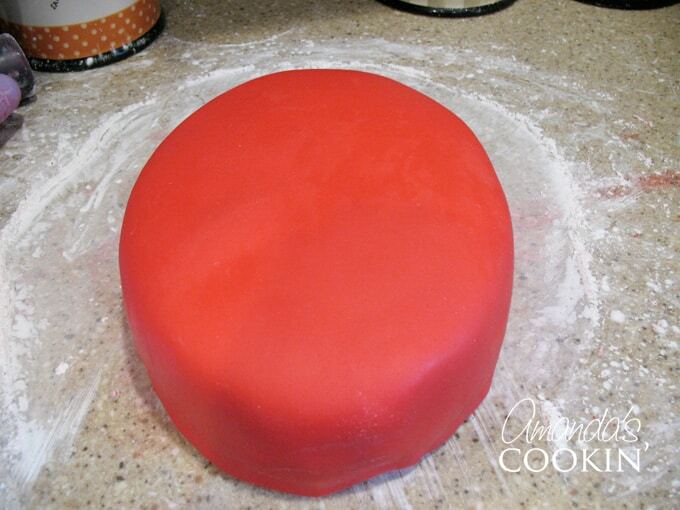 I separated the fondant so I could color the bulk of it red. I pulled out my red gel food coloring and started working it into the fondant, and then I RAN OUT. Luckily for me the bakery in town had an extra bottle and sold me one. Phew! Rolling the fondant out was easy, just make sure you use a good amount of cornstarch on the work surface or it will stick. Roll it 1/4″ thick as suggested by every tutorial I ran across. It lifted easily and went right on top of the cake without an issue. After trimming the fondant (I used the top of my turntable spice rack to place the cake on) to fit snugly around the cake, I then piped on the spider webs. I drew out the eyes and cut them from fondant using my drawing. Pasted them together with a little water and placed them on top of the cake. I used a tiny paintbrush dipped in water, squeezed out the excess and touched up the cake. Done! So all in all, even for my first time, I was pretty happy with it! My daughter and the birthday girl loved it, so that’s what was most important to me. Glad I conquered yet another fear that summer! Here’s the fondant recipe. if you can get through it, watch the video I mentioned above, just remember it’s kinda longish. 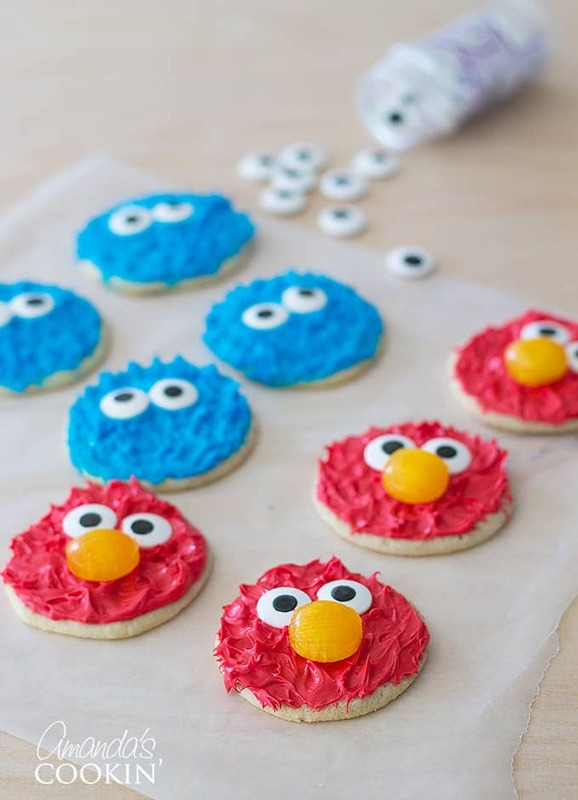 If you’re browsing around for more fun birthday party ideas, these Cookie Monster and Elmo cookies are SO easy and a lot of fun to make! You could even have the kids decorate them themselves as part of the party fun. Learn how to make a spiderman cake for that perfect superhero birthday party. We use homemade marshmallow fondant so it actually tastes good! Use the shortening to grease a large microwaveable bowl for the marshmallows, the mixer bowl, your dough hook, and a sturdy rubber spatula. Sift the powdered sugar and reserve about one cup. Put the rest into the greased mixer bowl. Put the marshmallows into the microwaveable bowl and add the water. Microwave in 30 second intervals until melted, stirring with rubber spatula in between intervals. Add the melted marshmallows to the powdered sugar. Lock the mixer and cover the opening with plastic wrap to keep powdered sugar from coming out. Turn mixer on low and allow dough hook to do its thing. Keep mixing for several minutes until the sugar seems to have incorporated for the most part. If still sticky, begin adding reserved powdered sugar, you may use it all, you may not, depends on your weather conditions. It's really humid here, so I used it all. 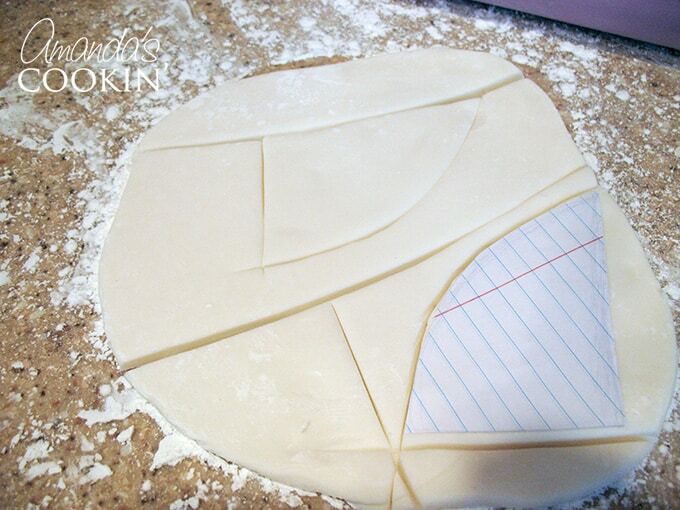 Fondant is ready when it balls up around your dough hook or when you can touch it and it's still pliable but not sticky. Remove from the mixer and wrap in plastic wrap. Allow fondant to rest for a minimum of 2 hours, I think overnight was best. To use the fondant, knead it several times, like you would bread dough, to get it to a workable consistency (much like that of Play-dough). To add coloring, do not use liquid food coloring. 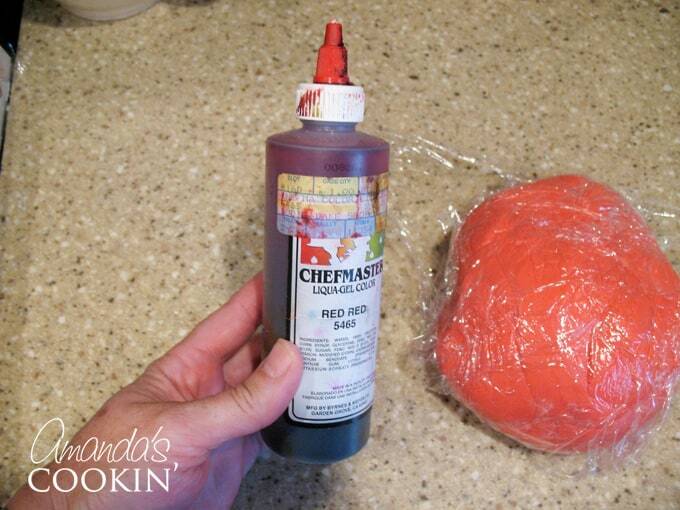 Use paste or gel colorings to a handful of fondant, then mix that piece into a larger batch. Cover work surface with cornstarch. 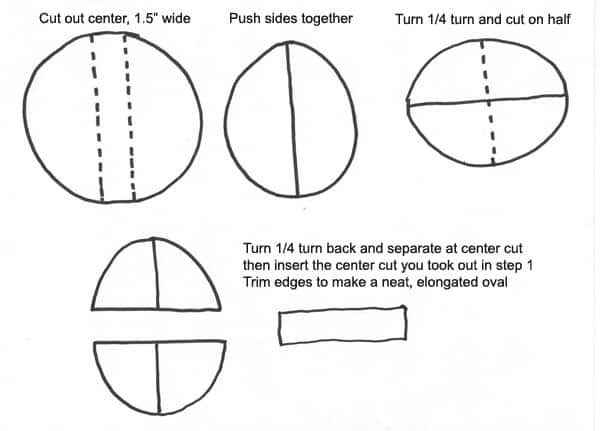 Roll out fondant to 1/4" thickness. Calorie count is for the fondant only! what is the amount of red fondant you needed to cover the cake overall? as I am not preparing it with homemade, have to see how much should I buy. Thanks! You could by one of the little tubs like these https://amzn.to/2IElNt1 – to be safe I would buy two of them. But start small, a little of this stuff goes a LONG way!! This is awesome. My 14 year old daughter is a Spider-Man fan. 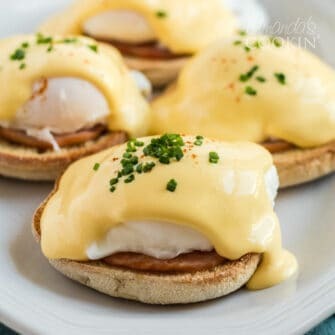 So we are going to make this. Why can’t you use liquid food coloring? Hi Karin! Liquid food coloring requires that you add far too much to get to the nice red color that the liquid would degrade the fondant. Gel food coloring mixes in beautifully and gives very vibrant color. Couldn’t you add the liquid color to the water in the beginning?? I wouldn’t. It’s gel food coloring, not liquid, so it could clump. How fun, happy birthday to your grandson! What size did your cake end up being? I know you started with a 9 inch cake but what size dos you end up with?